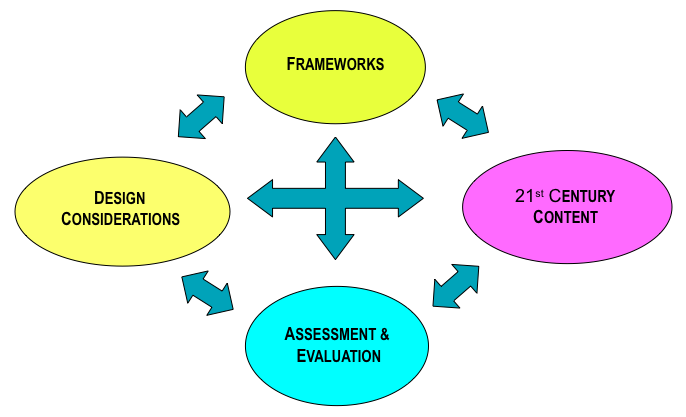 The Global Learning Curriculum Model consists of four components: Frameworks; Design Considerations; 21st Century Content; and Student Assessment and Evaluation that result in Global Citizen . It is developmental in nature and as such young elementary age students will be participating in activities that are precursors to actual global learning projects in which communication technology is used to connect with international partners to work on authentic global issues. Interpretations of the model should always keep in mind that acquiring the knowledge, skills and attitudes of a global citizen is the outcome of experiences across the entire K-12 years which then continue to evolve through one’s life experiences. The model is interactive as shown through the use of the two-way arrows. An educator may move among the model components as is appropriate for the curriculum designer’s needs. The Frameworks component is made up of 21st century skills, federal mandates for education, state and local standards, mission statements, and other types of frameworks that may dictate or at least direct the global learning activities and projects. The Frameworks component establishes a rationale or purpose for the global learning curriculum. The component of 21st Century Content features student knowledge, attitudes and skills that may be gained from global learning activities and projects. Skills such as critical thinking, creativity, reflection, metacognition, collaboration and ethical decision making are required when students are given a substantive and authentic goal to achieve. To participate in intercultural situations, students need knowledge including the interconnectedness and interdependence of humanity and the environment, and understanding of culture. Finally, students need attitudes such as respect for diversity, open-mindedness, and trustworthiness. The Design Considerations component contains various aspects of the learning experience that should be considered as the curriculum is developed. In true global learning experiences, the use of communication technologies is critical. One of the first considerations a global learning curriculum designers must make concerns what technology is available within their school and available to the global learning partner. These available technologies will structure the parameters of all activities and projects. Another consideration is that of cultural contrasts. In order to develop the knowledge, attitudes, and skills of a global citizen, students need to interact with culturally different students on a ‘face-to-face’ basis using communication technologies. We have found that students need to experience cultural contrast starting with small differences and working towards considerable differences. The greater the cultural contrast, the greater will be the student learning. Part of the global learning experience is to discuss global, real world challenges and work in intercultural teams to produce possible solutions to the challenges. The solutions compose the substantive and authentic goal that is another consideration in the design of global learning curriculum. The next component, Assessment and Evaluation, involves the assessment of student learning and the evaluation of the global learning unit or program design. The first step in assessment of student learning requires the determination of criteria that will be used to judge student mastery of the global learning outcomes. The curriculum designer uses a variety of instruments such as a rubric, marking guide, Likert scale, content test, and survey to gather data related to the assessment criteria of student products such as portfolios, student reflections, multi-media presentations, student generated surveys, and real world projects. The Assessment and Evaluation Component also suggests evaluation of large K-12 district-wide programs and university applications. The curriculum designer determines chosen aspects of the curriculum that are to be evaluated, which may include the appropriateness of the content scope and sequence, the success of the chosen teaching strategies, the adequacy of assessment tools, and the degree of student achievement. Global citizenship is the ultimate outcome of global learning curriculum. The curriculum designer will need to reflect on the proposed unit in order to verify that the curriculum is contributing to the acquisition of the knowledge, attitudes, and skills of a global citizen. Students who have participated in global learning curriculum should mature into global citizens who respect humanity and desire an equitable, sustainable future for all. Following is a table of a global citizen’s knowledge, skills, and attitudes. 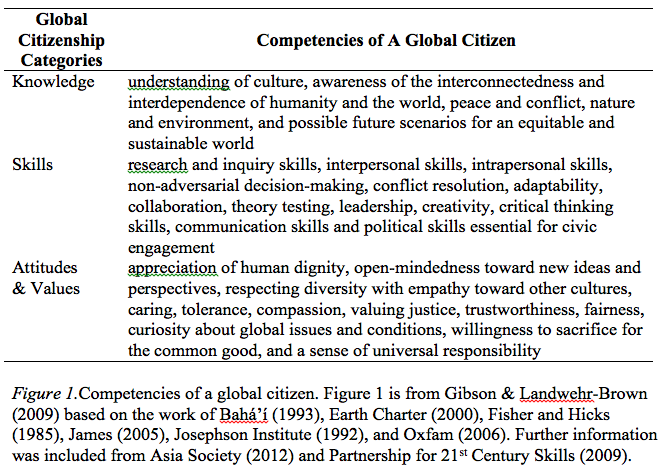 When one compares these with the content, knowledge, skills, and attitudes of global learning, one can see how designing curriculum using the model can result in students who exhibit the characteristics of global citizens. Fisher, S., & Hicks, D. (1985). World studies 8 – 13: A teacher’s handbook. London: Oliver and Boyd. James, K. (2005). International education: The concept, and its relationship to intercultural education. Journal of Research in International Education, 4(3), 313-332. Osler, A., & Vincent, K. (2002). Citizenship and the challenge of global education. Wiltshire, England: Cromwell Press. Teraguchi, D.H., & McTighe Musil, C. (2004). Diversity and global learning: Shaping effective general education requirements. Powerpoint presented at the General Education and Assessment Conference, Long, Beach, CA. Retrieved on January 21, 2010 from http://www.google.com/cse?cx=011623608364967583008%3A1x9o_ojmz28&q=diversity+and+global+learning+pp&sa.x=0&sa.y=0&sa=Submit. When citing this document, the following reference should be used.